Our question this week comes from a troubled young man in Miami. How troubled can one be if they live in Miami? The last time I saw my girlfriend she was kissing another guy. I punched him in the face and then left the bar. My girlfriend has called me a dozen or so times but I've refused to pick up. All her messages are apologetic. I just don't think I can trust her. That was two weeks ago. As if that wasn't enough, this week her mom showed up at my apartment. She said she wanted to plead her daughter's case. Apparently 'pleading' and taking off her clothes are the same thing. I won't lie to you, I thought about it. I mean she was standing right there naked. Nevertheless I'm not that kind of guy. Instead I ate a banana and took a cold shower. Thank you for your letter 'hating.' I can't help but feel that there are more pertinent issues that we should be discussing. After all, this is an advice column. However since you expressed no interest in my thoughts on your relationship, I will answer your question. A jot is the smallest letter in the Greek alphabet, which is in turn based on a Hebrew word for the smallest letter in the Hebrew alphabet. Essentially the 'i' or iota. The tittle on the other hand, refers to a small diacritic mark, like the dot above an 'i' or a lower case 'j'. Well I hope this has been a help to you. And good luck with the relationship. Ask an Earthworm is a weekly advice column. Use his advice at your own discretion. Have a question for Evan the Earthworm? Ask away. He'll do his best to answer as quickly as he can. All I gotta say is that image is making me wanna vom. Sorry! I can't get passed it. Ew! Ha ha! Haha. I know I know. It's just a temp pic though. I was going to draw out a cartoon worm, but doing that on a laptop isn't easy. 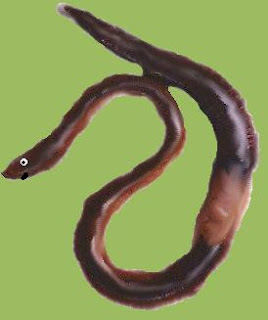 So I just manipulated an old worm picture. I might end up drawing one and scanning it in. You should have seen it before I messed with it. Now that was pretty nasty. I'm not familiar with the reference, no. What's the book? It's pretty short ... if you find a nothing-to-do-day and a big book store where employees don't hassle you just read it there. Haha I'll have to look for it.